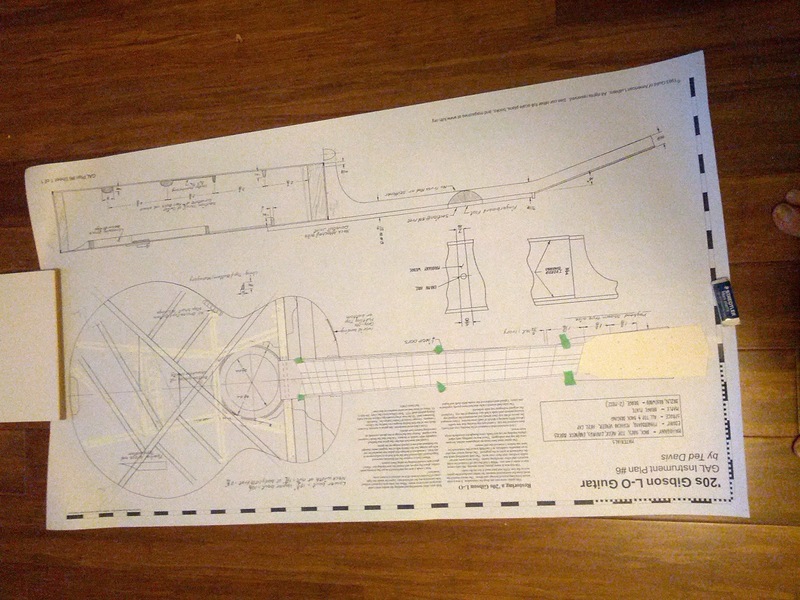 So I have a fingerboard layout and next on the list is sorting out the bracing design. The original Gibson L-O was "H" braced and that will not do for a MandoCello. So I'll design a more or less standard "X" brace for this.The trickiest part of this is positioning the X and getting the bridge path in the right spot. I decided to go with and X slightly shifted away from the sound hole, which will give a slightly stiffer lower bout. i was also thinking about using 3 tone bars but this looked like over kill so I went with the more standard 2. 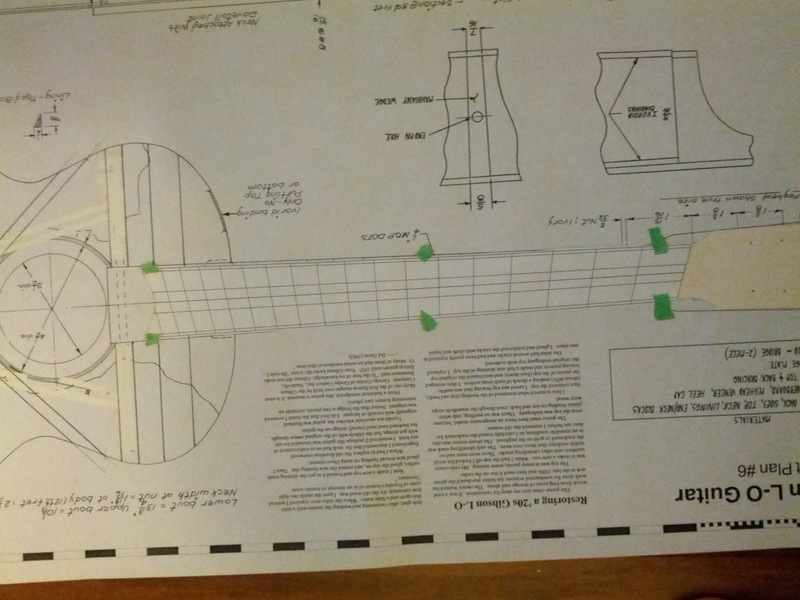 One of the big changes that came out of this exercise was what I had originally envisioned to be a 12 fret to the body instrument ended up a 14 fret to the body instrument. 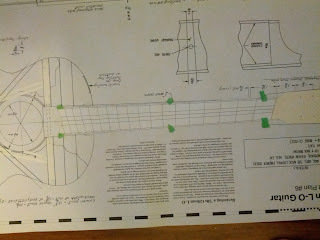 In the 12 fret configuration the bridge just did not end up in the right spot, this was due to using a longer scale than the original instrument and the fanned-fret configuration.. So a 14 fret instrument it is.. Now I guess I really do have to carbon fibre reinforce the neck as well as the truss rod. There are several reasons you might make a guitar a multi scale or fanned fret instrument, one is to make the instrument more ergonomic and playable the other is to allow for better string tension on the bass strings, which is my reason. 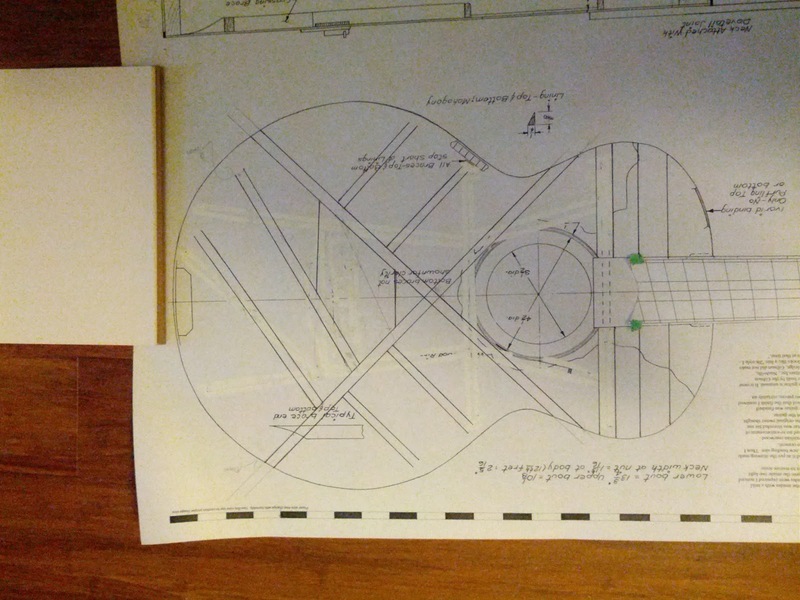 Since a MandoCello uses relatively large strings on the low C (0.070-0.074”) getting enough string tension at the shorter scale length I want to use (24.75”) is problematic so to help I’m hoping to do a fanned fret design with the treble side (A3) being 24.75” and the bass side (C2) being 26.25”. Unfortunately going to a fanned fret or multi-scale design changes the design of the entire instrument as the saddle, bridge and nut all now need to move around and this effects the brace position. My first consideration is getting the fingerboard properly designed and picking the strings. Choosing strings is an art in and of itself, there are many options and types to consider. I’ve looked at several types and since I want to do a pin bridge I need ball end strings. So after much thought and a bit of a guess work I’ve settled on stainless round wound strings for everything but the A string which still might be plain steel. Next the string gauge needs to be determined. Ideally all strings should have the same tension or a slight increase in tension as you go lower in pitch, at least that is what I am aiming for and that tension needs to be high enough so the strings are not “floppy” and low enough so the instrument can be built with reasonable bracing so that it continues to be responsive. So after some fiddling with an on line calculator (http://www.surveyor.com/guitar/stringtension.html) I’ve ended up with the following, C2-0.068; G2-0.046; D3-0.030; A3-0.018 which give 24 to 25# tension per string slightly increasing as they go lower. So around 200# total string tension which is say about what an extra light strung 12 string would be, I think. Now I need to design/modify the top bracing to accommodate the new bridge location.